UPDATE: we've now driven the 2018 SsangYong Musso in proper UK specification at last. Click here to read the full Parkers Vans and Pickups review. 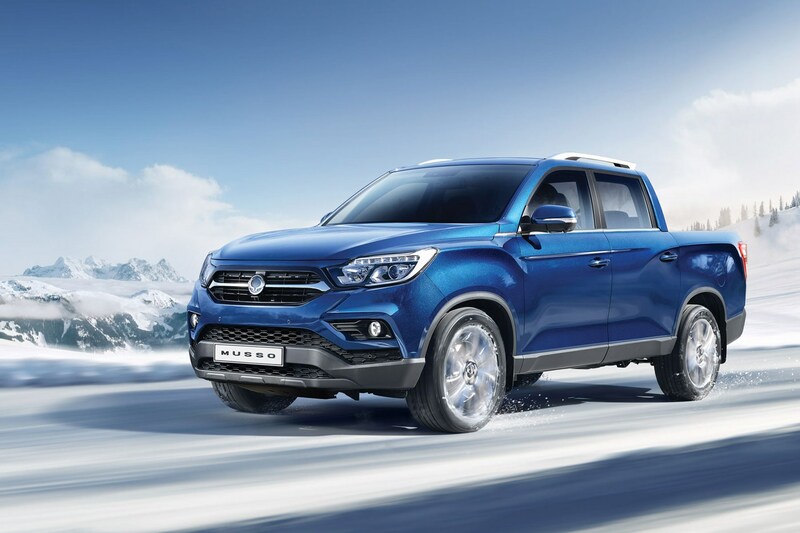 SsangYong launched its all-new Musso pickup truck at the 2018 Geneva motor show, and now we've had the chance to drive an early Korean market version, ahead of the UK version arriving here in the summer. From its attractive design to its powerful engine, the 2018 Musso certainly looks like a serious competitor – especially considering it’s likely to come with SsangYong’s typically bargain price tag. 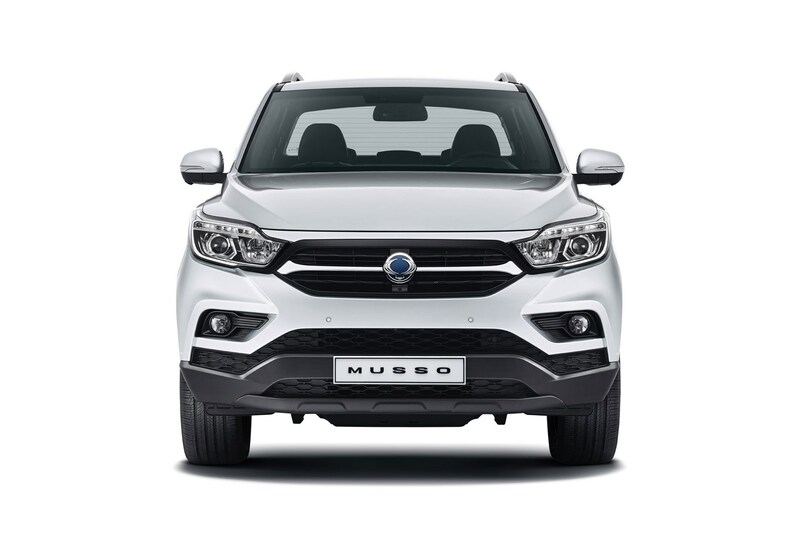 The new Musso also ticks all the right boxes in terms of payload and towing capability for the UK market, as well as claiming car-like comfort and lots of room for passengers – and promises to be built on a super-tough frame. Add the class-leading five-year unlimited mileage warranty, and it’s definitely a pickup that deserves a closer look. So read on for full details of the 2018 SsangYong Musso, including our initial review. As with the Honda Civic Type R Pickup and the Toyota Land Cruiser Utility Commercial, we’ve only driven the 2018 SsangYong Musso pickup briefly so far, at a general industry test day. This was enough to get an initial feel for the vehicle, however, and we were even able to take it off road. The only example in the UK at the moment is also a left-hand drive model built to Korean specification. We’ve been told to expect some changes, but since these are likely to be positive anyway, let’s focus on what’s already good about the new SsangYong Musso. The first thing being that it’s not the old SsangYong Musso. The new model is based on the same brand new platform as the latest Rexton SUV (details below), and your instant impression is not just that it looks much more modern – even premium – but also that it’s a significantly larger vehicle. This idea is reinforced when you open the door and check out the passenger cabin. 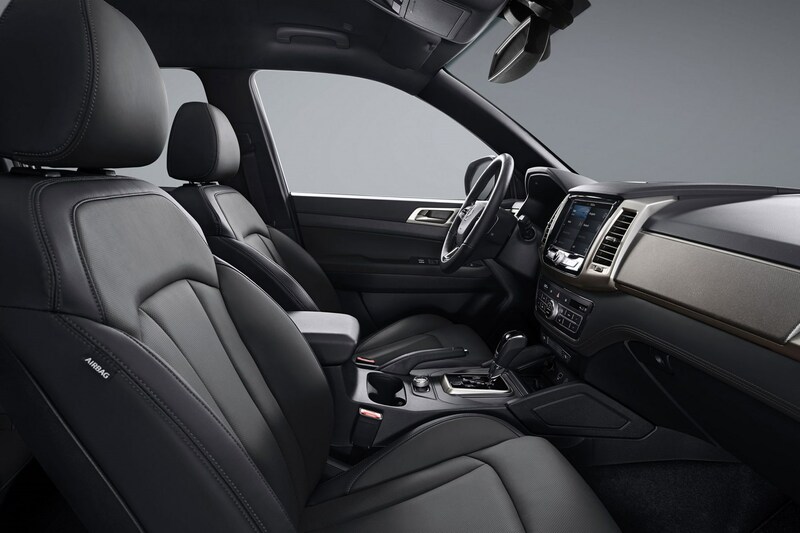 As before, SsangYong only plans to sell the Musso as a double cab model, and the result is now easily one of the largest interiors in the pickup class, with especially generous space for people in the back seats. Legroom in particular is enormous. Up front the dashboard has a far more appealing design, but also incorporates an impressive amount of fancy technology – including a full colour screen within the instrument cluster as well as the touchscreen infotainment system we’ve come to expect these days. The driving position seems sensible, with a good range of adjustment, but we’ll delay a full opinion on this until we’ve spent a longer amount of time behind the wheel (which should be in early July 2018). 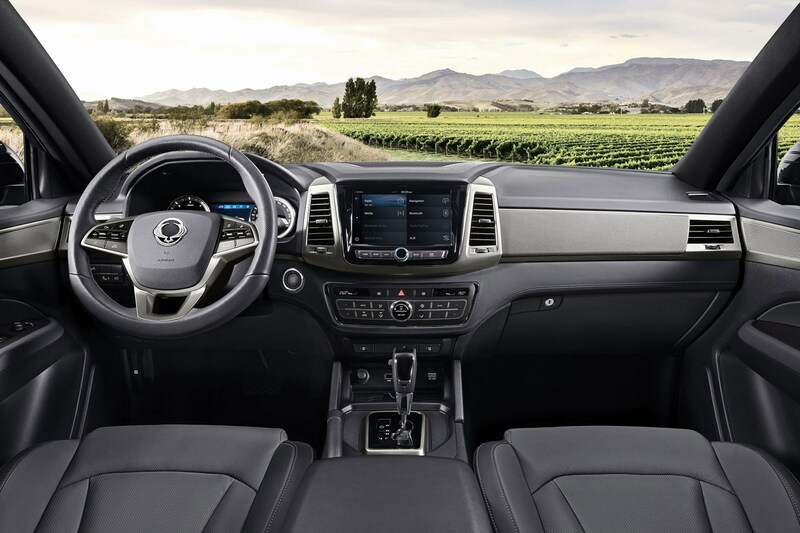 What can you tell us about the SsangYong Musso’s driving experience at this point? The thing that really grabbed us was how quiet it was inside – with very little sound from the new 181hp 2.2-litre turbodiesel entering the cabin. The engine seems smooth and well-matched to the optional six-speed automatic transmission fitted to this example. The auto also gets a little more torque – 420Nm rather than 400Nm – helping to compensate for any losses within the gearbox. The steering is more linear and reassuring than the current Musso, and the ride comfort better resolved – although as with all pickups, the rear does fidget and bounce a bit without any load in the back. What’s the SsangYong Musso like off road? The part-time four-wheel drive system can easily be switched to full four-wheel drive for trickier surfaces using a neatly finished rotary knob ahead of the gear lever. Grip around Millbrook’s genuinely challenging off-road test facilities was no issue whatsoever – although it was a dry day, so the Musso needed only to deal with slippery dust rather than claggy mud. We’re confident it will cope with the kind of off-roading most customers will need it for, however. This Korean model also usefully played a gentle tone to let you know the hill descent control was activating – a small thing but actually quite a reassuring one, as quite often you find you have to take these systems on faith. We’ll be bringing you a much more comprehensive review of the new SsangYong Musso on Parkers Vans and Pickups in early July 2018 – but until then, suffice to say, we’re really pleased to report that the 2018 model is an enormous improvement over the Musso pickup it’s replacing. Highlights so far include the smooth, quiet engine, competent off-road performance and really rather nicely finished cabin. Given we’re assured that pricing will remain highly competitive – which means the Musso is likely to be one of the cheapest double cabs on the market – we think SsangYong could have a significant success on its hands here. 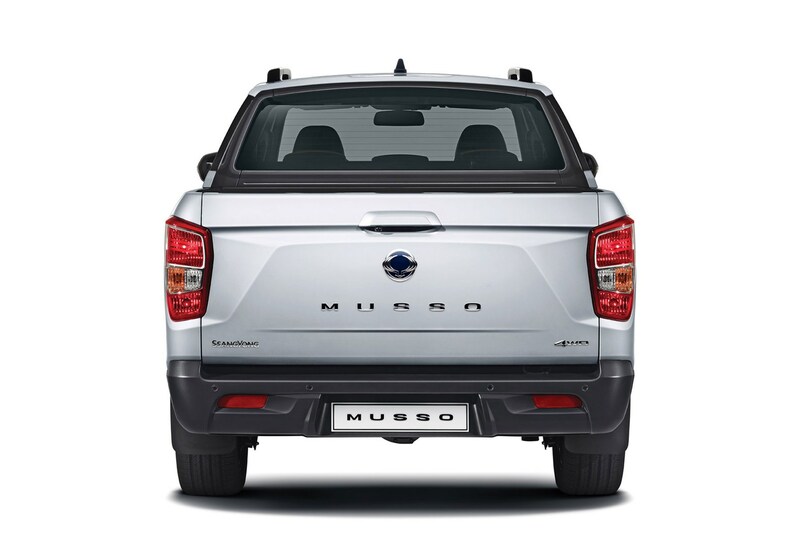 The 2018 Musso comes as a double-cab only and is based on the same platform as the latest SsangYong Rexton SUV. In fact, park them side by side and you won’t be able to tell the difference until your eyes get beyond the rear doors. That’s how similar they are. 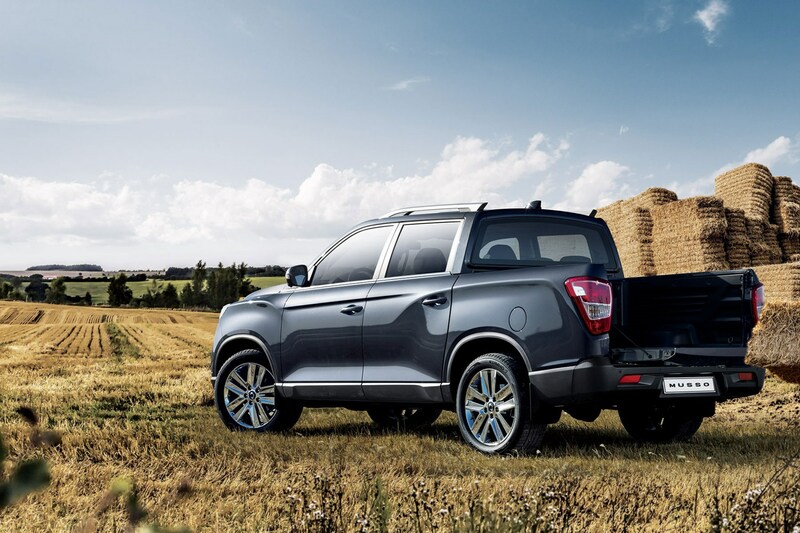 Beneath the modern design, which features SsangYong’s distinctive new ‘shoulder wing grille’ at the front, the Musso retains a traditional ladder frame chassis. 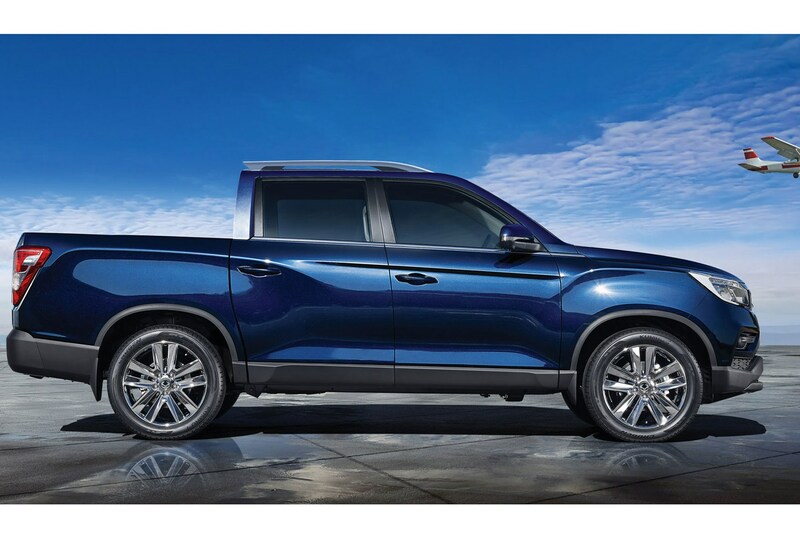 However, this ‘Quad-frame’ construction uses what’s described as ‘ultra-strength’ steel – which SsangYong not only claims makes the new Musso stiffer than all its rivals, it’s also said to be a world first. This should be good news for safety and refinement. Under the bonnet is a new 2.2-litre turbodiesel engine, also borrowed from the Rexton and labelled XDi220. It gives the Musso 181hp and 400Nm of torque (420Nm with the automatic transmission), a healthy amount for a budget pickup, if a fair way off what the most premium models now offer. 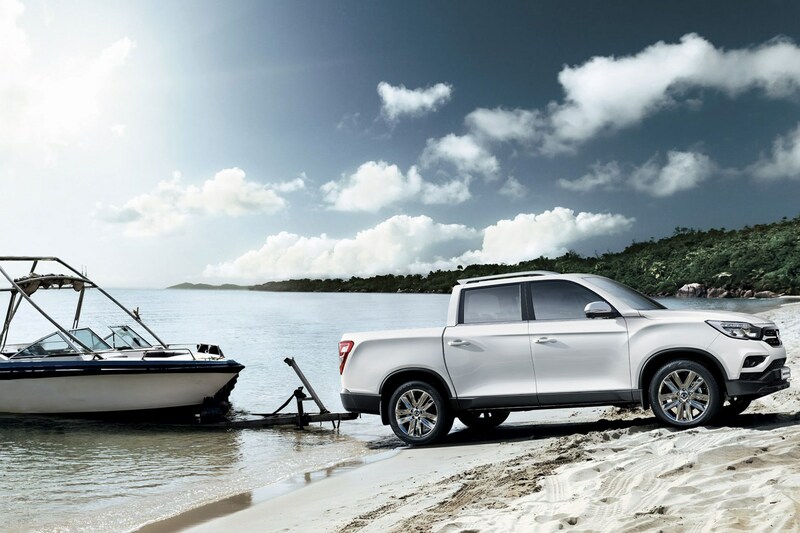 The engine is mated to either a six-speed manual gearbox or a six-speed automatic, and every new Musso is fitted with a part-time four-wheel drive system. Top speed for the manual is 121mph, while the automatic reaches 115mph. Claimed fuel economy is 35.8mpg for the former, 32.8mpg for the latter – middle of the road at best for a current pickup. In its home market of South Korea, SsangYong offers the Musso in two body lengths, but only the shorter one has so far been confirmed for sale in the UK. So although load bed dimensions have not been confirmed at this stage, it doesn’t look much bigger than the outgoing model – which was just about the smallest double-cab pick for load area. 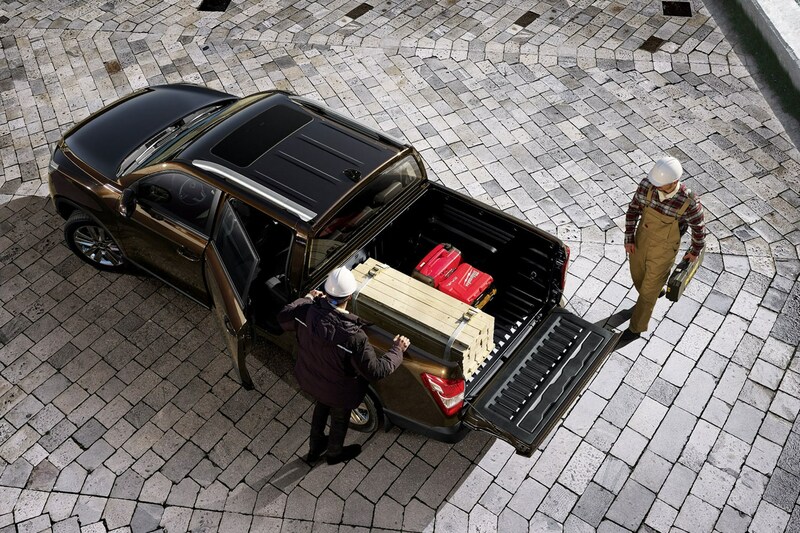 SsangYong says it does have enough a space for a Euro pallet, and although UK specification hasn’t been confirmed, all versions of the Musso sold here will have a payload in excess of one tonne (1,000kg) – important for both practicality and tax purposes. Similarly, towing capacity for the UK will meet the now expected 3.5-tonne (3,500kg) benchmark, even though Korean versions are limited to 3.0 tonnes (3,000kg) at best. You only need to glance at the pictures to see the new Musso’s interior is a big step up from the old model. The intention is for it to feel much more like a regular passenger car inside, while maintaining a strong impression of durability. 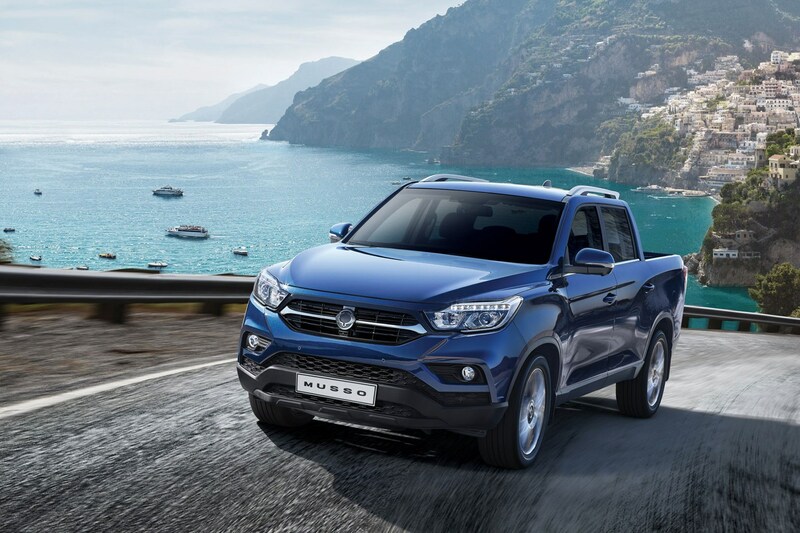 All models are fitted with DAB digital radio and Bluetooth as standard, and the Musso is said to have one of the roomiest cabins of any pickup – with three adults able to fit comfortably in the second row of seats. Every Musso above the entry-level grade will also be fitted with an 8.0-inch touchscreen infotainment system that features Apple CarPlay and Android Auto. Top spec Mussos come with Nappa leather seats, too. In addition to its exceptionally strong frame construction, the Musso is available with up to six airbags and has been designed with crash structures that are intended to minimise injuries to occupants and pedestrians should the worst happen. Both the price and the exact on-sale date are still to be confirmed for the UK, though the new Musso should start arriving in dealerships in summer 2018. Given the more powerful engine and more sophisticated standard kit, we’re expecting a slight rise in price over the out-going model – but this is still likely to remain one of the best value pickups when it comes to cost. Helped by the five-year unlimited mileage warranty. As such, its closest competitors are set to be the Mitsubishi L200, Fiat Fullback and Isuzu D-Max – rather than the likes of the Ford Ranger, Nissan Navara and Toyota Hilux. We’ll bring you more information as soon as it becomes available, so stayed tuned.